The Toyota Etios Cross was launched in 2014. The body was similar to the Liva but with much more body cladding to challenge Robocop. Toyota being one of the brands known for their service and quality decide wanted to take market share in this segment too. Now little over half a decade over. Let’s have a look as what is in store for us. The Etios Cross is built on the Etios Liva platform and it can be seen. The tyre size has been increased to 15-inches from the sedan. The alloy wheels are available are diamond-cut machine finished and the Etios Cross comes in eight body colour options. The Etios Cross gets body cladding with the Cross badging on it. The front of the Etios Cross gets a huge cladding, which makes it look like a bull-bar and even the fog lamp design has been changed. The bumpers are black in colour to make it look dual-tone. The side and the rear also have the same cladding with the Etios Cross badging on it. The Etios Cross also gets roof railings to carry on with the styling. The B-pillar has been blacked-out and even the door handles gets chrome on it. The front and the rear get brushed aluminium finish to make it look like skid-plates. There is also a dual-tone rear spoiler on the Etios Cross. Most of the changes on the Etios Cross are cosmetic. In reality it is the same Etios Liva with bumped up styling. Step inside the Etios Cross and you find yourself in a familiar cabin. The layout of the dashboard hasn’t changed which is dissapointing as the centrally mounted instrument cluster is still not easy to read on the move. That said, the cabin looks much improved thanks to the use of piano black inserts on the doors, instrument cluster and centre console. Quality inside seems improved as well but is still not up to Toyota’s legendary standards. Our test car which had done only 130 kms showed signs of rattling over bad roads, which can be attributed to the light weight of the vehicle. The other change to the interiors is the Etios Cross badging on the seats. There is ample amount of room inside the cabin, with rear seat passengers having enough space to stretch out in utmost comfort. Even the seats offer good support making the Etios a comfortable car to be in. The boot is reasonably big at 251-litres and it’s when you close the boot lid do you realise the Etios is a very light car. Toyota is offering the Etios Cross in 4 variants – G, V, GD and VD. All variants get a 2-DIN audio system with MP3, FM and USB functions but the top-spec trim also gets steering mounted audio controls and Bluetooth connectivity. The Etios Cross comes loaded with quite a few features even on the base trim but the lack of internally adjustable ORVMs is a shocking omission. The Etios Cross is being offered with three engine options, one is the 1.4-litre diesel that produces 67bhp of power and 170Nm of peak torque. The other two engines are the 1.2-litre and 1.5-litre petrol that churns out 79bhp and 89bhp respectively. These are the same engines that have powered the Etios and the Etios TRD.The diesel is the most frugal amongst the three and has good drivability too. Lug it in to a higher cog and the engine pulls cleanly without any issue. The NVH levels are moderate and there is some amount of diesel clatter on cold starts. This, however, settles down once the engine warms up. Driving in city and highway is a breeze and you don’t have to downshift much. One can easily potter around in city traffic. The diesel engine is extremely fuel-efficient as it returns about 15km/l in city driving. On the highway, it generally tends to return between 18-20km/l. The 1.5-litre petrol is the quickest of the lot and has no issues when it comes to drivability. The NVH levels are low like any other modern day petrol engines, bearly any noise could be heard. This mill has a wide spread of torque and Toyota has ensured that the driver doesn’t need to shift very often. The power to the weight ratio of the Etios Cross 1.5 makes it quick. This is despite the fact that the 1.5-litre petrol engine produces under 90bhp. The Etios Cross is one of the fuel-efficient petrol engines too, again due to the reduced body weight. We haven’t got our hands on the 1.2-litre petrol, but from our previous experience of this engine, it should be fine to drive. The drivability hasn’t been compromised and as there isn’t much of a difference in weight between the Etios and the Etios Cross, it should be similar. The 1.2-litre engine is available only on the base model (G) and 1.5-litre comes on V, the diesel is available in both the variants. Toyota’s motives are clear here. A car that can take you from point A to point B. There can’t be anything more clear than the 900 km range for the diesel. The steering is super light and the suspension super soft. But on the flip side the soft suspension and the 170 mm ground clearance make the car top heavy on corners and give a bit of body roll. Though it makes it very easy to ride in daily traffic and highway drives too are good but you can’t push the car around too hard. The diesel engine is a bit noisy if pushed too hard. If we compare the petrol to the diesel, the petrol is better for quick city stints. And the diesel is an effortless mile muncher, at the same time the diesel has taller gears thanks to the enormous torque hence leading to lesser gear shifts. The option of 1.2 and 1.5 petrol gives you a choice between efficiency and performance. The ease of driving is only proven by the no of cars used by a lot of women drivers. The Etios Cross isn’t much different than the regular Etios Liva, as it carries the same underpinnings and engines. With unchanged mechanicals, the performance and dynamics are almost the same. 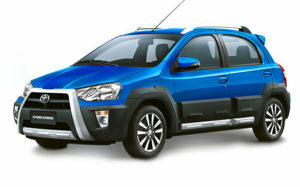 However the Etios Cross is a car which has some attitude and muscularity. While it still isn’t the most polished when it comes to interior design and overall quality, the Etios Cross comes across as a much more appealing Etios. Coming at quite the premium, the Etios Cross is without doubt the best version of the Etios yet but not really worth buying over better cars at that price.